The role of colors in culture is rather specific. On the one hand, people do not think much about colors in their everyday life. On the other hand, they pay great attention to them when choosing such goods as clothes and home furnishings. When a stranger visits an alien culture s/he understands that his/her color perception is rather different from the perception of those native to the culture. Natives pay attention to some colors and ignore others. Color perception becomes a part of tradition. These photos depict the variety of colors used by Guatemalans. Putting these photos together we can notice that sets of colors used in decorating clothes, buses, and buildings are rather similar, with the palettes of colors being extremely varied.. There are enormous gradations of red, blue, yellow on the clothes, the buildings, and to a lesser extent, the buses. These photos illustrate a link between traditional culture and globalization of cultures. We can see people in traditional clothes, but a similar color spectrum decorates the buses. Although vehicles are artifacts of modern civilization, the traditions of the Guatemalans transform them and they are assimilated in the structure of traditions. Buses decorated in this way, far from arousing discomfort in traditional people, become a part of their national culture thanks to this transformation. 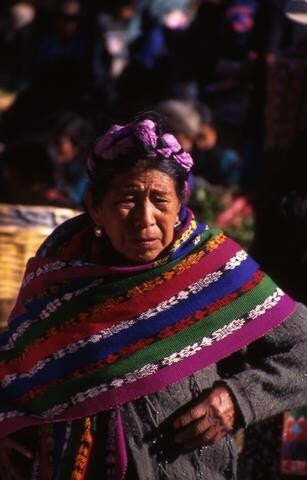 Rachel Tanur's photograph shows a Guatemalan woman, in a public place, probably in a market. In the middle of the frame an aged woman, possibly an aboriginal woman, dressed in traditional clothes. The "visual message method" (Joly, 2008), allows me to decompose the photograph in order to analyze its ethnographic meaning. The plastic message describes the way the image was constructed. The first plastic characteristic of the photograph is the vertical framing. The vertical frame forces us to concentrate our view on the aged woman. The reduced depth of field and the use of a standard or telephoto lens, isolates the main subject from the social environment in which the image was taken. Consequently, the photographer forces us to analyze the details of the main character. The central presence of a Guatemalan woman in the middle of the frame is revived by the presence of a reduced depth of field (DOP that blurs the subjects that are behind the woman). We can distinguish some elements of the context (a group of people, a handmade basket), however our sight is directed to the woman's face. As Erving Goffman did forty years ago in Gender Advertisement (1979), the ethnographer is forced to analyze meticulously the characteristics of the actors. Her physiognomy, the way she dresses and the way she keeps her body show us some "ethnographic characteristics" of the actor. The visible left hand gives us information about the kind of job she realizes ordinarily (probably manual tasks). Rachel's photo isolates the main subject by reducing the depth of field. Therefore, we can see clearly the ornamental details of the Guatemalan woman: the way her hair is arranged, the use of earrings, the external "dressing code" based on a colorful garment and an internal coat. The photograph of Rachel Tanur has ethnographic and documentary value as she describes the social world of a specific community by combining different aspects of Guatemalan life (cf. the photographs Guatemalan Clothesline, Guatemalan Communal Laundry, Guatemalan Houses, Guatemalan Farmland, Guatemalan Bus Stop) with a close view of people (portraits of Guatemalan Men and Women). This photograph explores the complexity of social life by describing ethno-methodologically the characteristics of locals: the image allows us to discover some of the main characteristics of the person, in particular her dressing code and other physical features. Thereby, Rachel's photograph may help to answer the question formulated by John and Malcolm Collier at the beginning of Visual Anthropology: the camera, and more widely photography, is value to ethnography because it allow us to understand, by using a nonverbal language, the specificities of social life by engaging new understandings of social interactions. Collier, J., & Collier, M. (1986). Visual Anthropology: Photography As a Research Method (Rev Exp). Albuquerque: University of New Mexico Press. Joly, M. (2009). Introduction à l'analyse de l'image. (F. Vanoye, Ed.). Paris, France: A. Colin, DL 2009. Goffman, E. (1979). Gender advertisements. Cambridge, MA, France: Harvard University press.